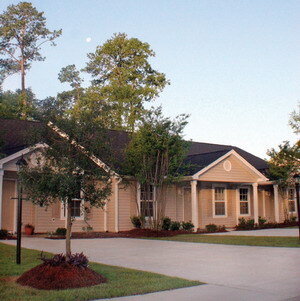 NESTLED IN THE HEART OF THE Lowcountry, you will find Hidden River, complete with mossy oaks, quiet walking trails, tennis courts, a play park, a clubhouse and a junior Olympic pool. This secluded hideaway rests on 75 acres near the Ashley River, centrally located between historic Charleston and the quaint town of Summerville. In addition, Hidden River is just minutes from the airport and a variety of restaurants, grocery stores and great shopping. Cloice Janson is owner/broker of Janson Realty Homes Sales Inc., exclusive listing agent for Hidden River. She gave the community its name because it borders miles of marsh and the Ashley River. "As far as our future plans relating to the exclusive 13-acre island abutting Hidden River, there is already talk of developing the island and creating walking trails to the marsh and the river-s edge," she says. For nearly three decades, Janson has prided herself on giving her clients exactly what Hidden River offers: more square footage for less money, upgraded standard features, innovative floor plans and an excellent location. The Hidden River town homes showcase an interior accented by vaulted ceilings in the great room and master bedroom, an array of quality features and plenty of sunlight. The plush carpet comes with a 10-year warranty, and the stylish flooring in the bathrooms and kitchen offer the look of ceramic tile and the durability of easy-to-clean vinyl. The galley kitchen is equipped with track lighting and quality appliances, and custom wood cabinets and drawers provide plenty of storage. You can relax in the great room in front of a fire or take in the peaceful scenery from the double-pane windows, which tilt in for easy cleaning. Outside you will find lush landscaping, sodded lawns and a sprinkler system. A patio and storage unit in the back are stocked with precut hurricane boards for your convenience and peace of mind. Another bonus feature is a parking pad right outside your front door. The sense of security offered by this serene gated community, plus its unique combination of location, price and quality construction, makes Hidden River on the Ashley an excellent buy. You can choose a home that is right for your needs among the two and three-bedroom, one- and two-story plans, some with garages. The first phase of construction is almost sold out but two phases remain. For more information about Hidden River, contact Janson Realty at (843) 991-9900 or (843) 514-2067 or visit www.HiddenRiverOnTheAshley.com. The seller will pay $1,500 in closing costs using Janson-s preferred lender and closing attorney.